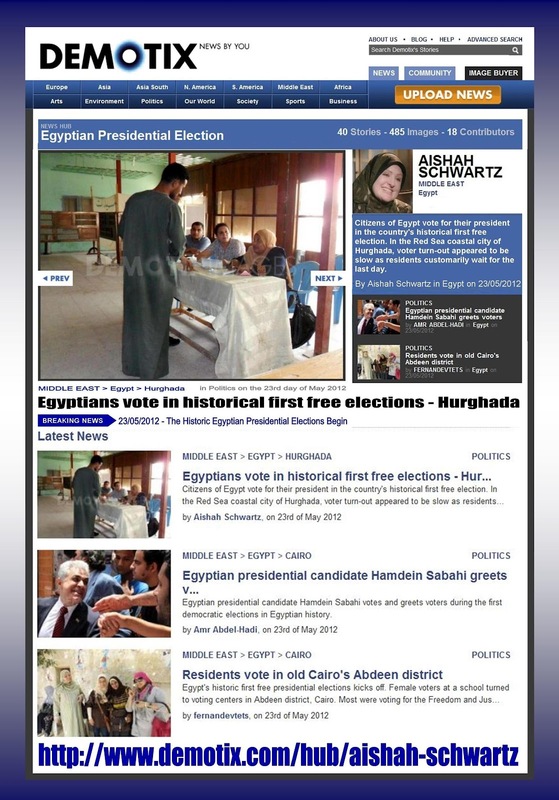 What Happened in Egypt’s Presidential Elections? "Low turnout: Despite the intense interest and the high stakes, it appears that most Egyptians are tired and simply did not show up. Some revolutionary groups have actually called for a boycott of the elections, arguing that the elections are meaningless without cleansing the state from the fulool or military control. During the parliamentary elections late last year, more than 27 million Egyptians participated. Although there are 51 million registered voters only an estimated 24 million cast their votes this time or about 47 percent as compared to 62 percent during the parliamentary elections." What you see is what you get; there were NO LINES at polling stations in Hurghada, Egypt. There were no "lines" of people waiting at any of the polling stations I passed by. And even security in front of the stations were "forbidding" that photos be taken. I got the front of one station simply because I snuck it from the backseat of a taxi while passing by. It is not a coincidence that one candidate is a member of the Muslim Brotherhood, the other Hosni Mubarak's last prime minister. Egypt's revolutionaries wonder: Why did a Mubarak holdover like Shafik do so well? "The only pattern of this election is the voters said we want what we are used to," Zaid Akl, a political analyst at the Cairo-based Al Ahram Center for Political and Strategic studies said. (Reuters) - When he joined the race for Egypt's presidency just five weeks ago, Mohamed Mursi was mocked as the Muslim Brotherhood's uncharismatic "spare tyre" after its first-choice candidate was disqualified. Mursi has called for a review of Cairo's 1979 peace treaty with Israel, saying Egypt's neighbour has not respected the agreement, a line mirroring that of most of the other candidates in the race. The group has said it will not tear up the deal. CAIRO — Former President Jimmy Carter said Saturday that monitors noted violations during Egypt's presidential elections but that the vote was generally acceptable and the irregularities won't impact the final results. We hope that Egypt find peace! interesting and thanks for sharing, come and share some love over @ i-reminisces.